It is safe to judge a magazine by its covers? It's a question worth asking when considering GQ magazine. The 50 year old publication currently features on its website every cover of its half a century in print. The images reflect changes in media. The covers go from the conceptual, stylized, and highly editorial to celebrity-centered and - during a span in the 1980's - kinda formulaic. So what makes a good cover? How to best represent the content of a particular issue while still getting it off the rack? Of particular interest to me is how Black images have been used in the history of a publication the I admire so much. A brief analysis uncovers some interesting facts. Of GQ's 529 covers, 57 feature Black faces. 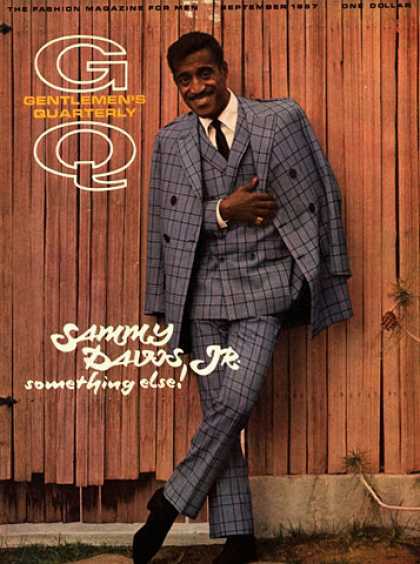 The first Black man to grace the cover of the mag was none other than Sammy Davis Jr. in the September, 1957 issue. The first Black model to cover GQ was Renauld White in 1979. Of the 57 covers featuring Black people, 28 are athletes, nine comedians, three rappers, and one President of the United States. categories: "Books", "GQ Magazine", "Journalism", "Race"